For those of us with little experience of living alongside wild populations of large carnivrores it can be tempting to assume that such beasts would keep well clear of human habitation for fear of reprisal. However animals are not programmed to recognise boundaries between the ‘wild’ and human populated parts of the landscape; there may be no reason to recognise an agricultural area or a road as a ‘no go’ as opposed to forest, scrub or other more suitable habitat. Additionally many of the large carnivores have extensive home ranges or are habituated to wander or migrate, wolves being a well documented example. The other side of things is equally true; in many environemtns humans expect free access and the opportunities to exploit resources, whether on a personal, family, social or industrial level. The image below highlights the potential dangers of this mutually exclusive, but spatially overlapping expectation. In the Tadoba Andhari Tiger Reserve there are still a few villages, so people’s day to day lives can unexpectedly cross the lives of tigers. A bad outcome for either species following any interaction is unlikely to be a good outcome for conservation. 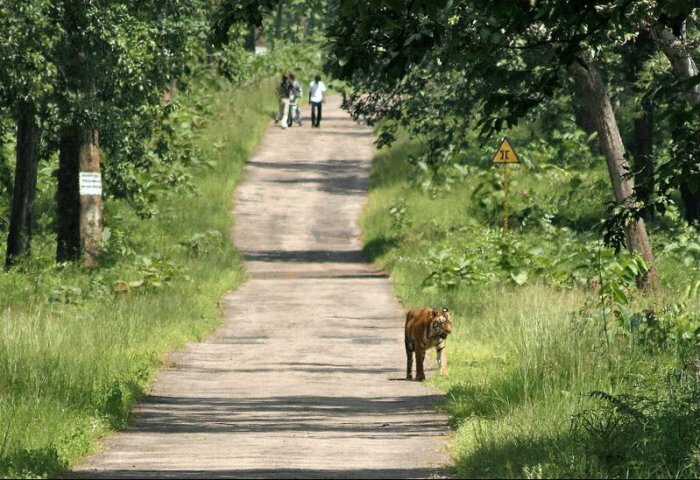 A tiger walks on the main road in Mohurli Range in the Tadoba Andhari Tiger Reserve (TATR) completely oblivious to the humans and vice versa! Fabbri, E., C. Miquel, V. Lucchini, A. Santini, R. Caniglia et al., (2007). From the Apennines to the Alps: colonization genetics of the naturally expanding Italian wolf (Canis lupus) population. Mol. Ecol. 16 1661–1671. This entry was posted in Conservation on September 10, 2014 by Simon Black.